It might seem at first glance as though The Extra Man (2010) is a film about contemporarily misplaced dandys or the struggle of the individual to reconcile his interiority in an o’erbearing and rapidly advancing societal structure. But it seems to me at least, upon further reflection, that The Extra Man is in fact a film about a city. And not just any city; New York City: an intrepid psychogeographical palimpsest; simultaneously existing in both the past and the ever advancing present. When young dandy Louis Ives (superbly performed by Paul Dano) is fired from his respectable teaching job at Princeton for inappropriately mishandling a colleague’s “undergarments”, he decides it might just be the perfect catalyst for him to take a risk and move to New York, a decision with which his late employer decidedly, judgementally, agrees, “I think New York would be the perfect place for a young man – like you.” Already situating provincial ivy league townships in the US as oppositional to the big smoke, New York is presented as somewhere inclusive or, at least, cosmopolitan and diverse enough in its acceptance of people who might otherwise find themselves anomalous amidst their surroundings. 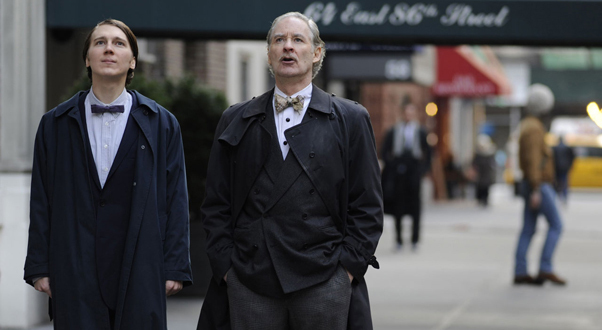 Upon arrival in New York however, Louis comes into almost immediate contact with one eccentric old man, Henry Harrison (faultlessly performed by the flamboyantly fantastic Kevin Kline). Harrison serves as both Louis’ landlord and societal mentor, based in part upon a shared longing for the style of writing, and indeed the style, of F. Scott Fitzgerald, and, most notably, his construction of masculinity in The Great Gatsby. At this stage, still optimistic about his journey through subjectivity, Louis is told in no uncertain terms by his “mentor” what is to become his most important lesson in life, “You won’t find yourself in New York.” That Louis would even conceive of such a thought is practically unbearable, for it is not the role of the individual that is of significance in this film, it is the city. In a manner of speaking, Harrison’s first lesson to Ives is that small-minded people look to find themselves – something easily done in a small town – but broad-minded, interested (distinct from interesting) individuals are drawn to interesting cities where subjectivity gives way to greater questions of anthropology. As Louis attempts to contend with the city he also wrestles with himself but ultimately the city holds a far greater sense of history than the individual. That the characters in the film appear at times to be caricatures of extreme stereotypes speaks to the film’s strong sense of awareness regarding the individual’s inherent need to find an identificatory connection to the past; a connectedness that the city already, and inherently, holds. What’s left at the end of the film is a young man and a older man who, despite their disparity and despite their incompatibility, co-exist with a strange sense of cohesion, much like the contradictory contexts and content of NYC. The Extra Man is an exclusive Cinema Nova release and sessions start from Thursday September 16.